Azmia Magane is a poet and writer, with bylines in Elle, Latina, Glamour, Allure, Teen Vogue, New York Times’ Women in the World, Huffington Post, and more. In March 2017, during Women’s History Month, MuslimGirl.com founder Amani Al-Khatahtbeh decided to spearhead an international initiative to celebrate Muslim women called #MUSLIMWOMENSDAY. 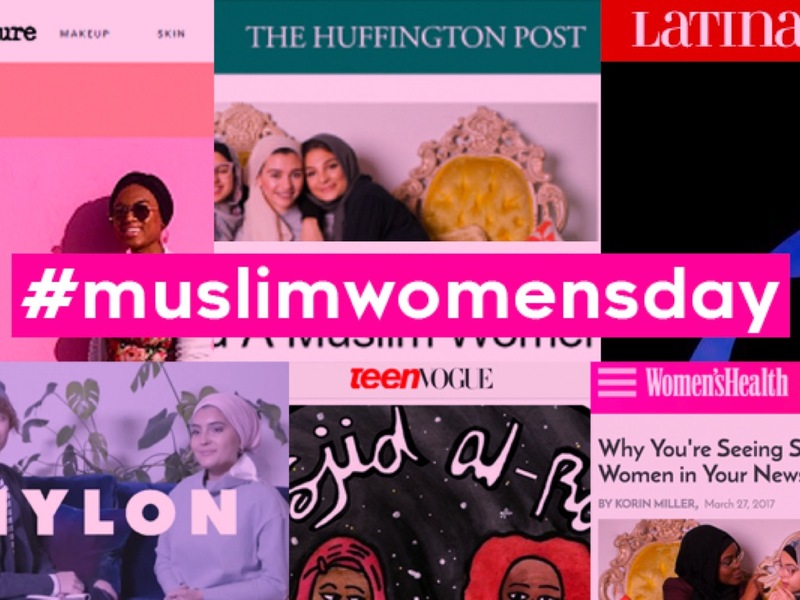 MG teamed up with notable allies, including Teen Vogue, Latina, Complex, MTV, NYLON, Women’s Health, Refinery 29, and more, to center the narratives and voices of Muslim women. The corresponding hashtag campaign was a viral success, with over 72 million impressions. At the time, I was serving as MG's chief of staff. I was responsible for creating a range of story ideas for content that would be placed at allied outlets. This included a story I wrote for Latina about how Islam revolutionized what it meant to be a woman for me by helping me overcome societal pressures related to women and our appearances. 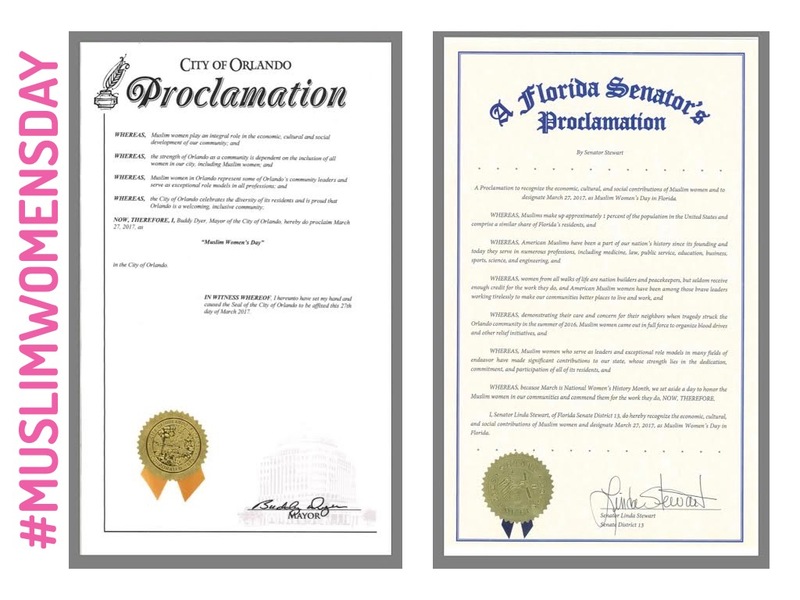 I then took initiative to make #MuslimWomensDay an official day by having the day designated as such by the city of Orlando and state of Florida. The proclamation also included language that credited women for their often overlooked role as nation builders and peacekeepers, and recognized that Muslims have been a part of our nation’s history since its inception. The proclamation was then signed and enacted by Orlando’s Mayor Buddy Dyer. With the help of my friend Ali Kurnaz, Senator Linda Stewart also signed the proclamation, making it a statewide declaration. I then teamed up with CAIR-Florida and the local Muslim Women’s Organization to have an Orlando event celebrating Muslim Women’s Day. My good friend Rasha Mubarak, who is CAIR-Florida’s Orlando Regional Director, coordinated the event, at which time Orlando Mayor Buddy Dyer read and presented the proclamation to a group of local Muslim women. 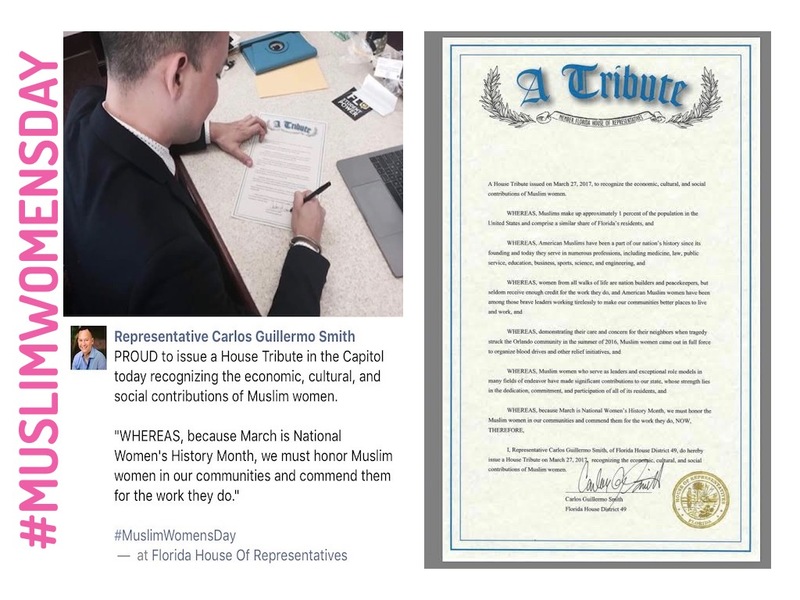 Rasha was also able to have Representative Carlos Guillermo Smith enact the proclamation via a House Tribute, which was later formally presented on Florida’s Muslim Capitol Day at the Florida Capitol in Tallahassee on April 5, 2017. Unfortunately, I was unable to attend both events, but I celebrated in spirit and solidarity from Morocco. Our efforts were recognized by the BBC and Middle East Eye. 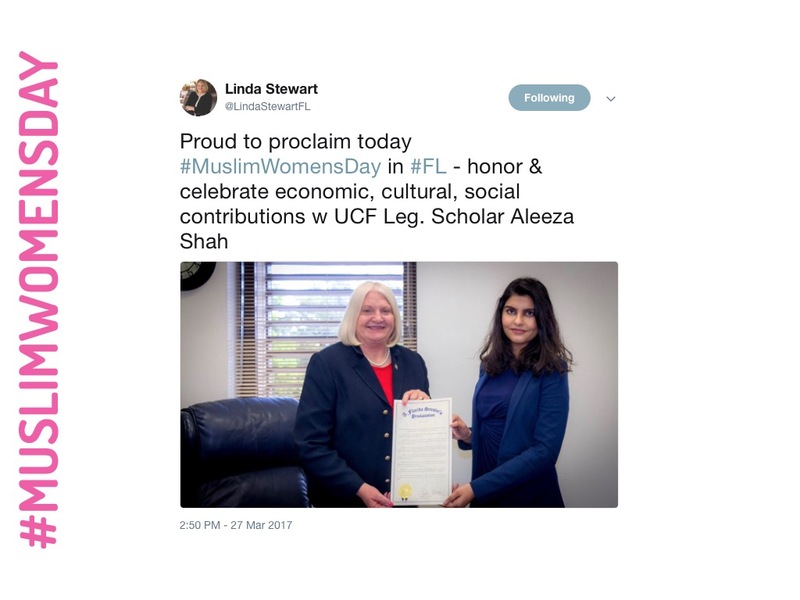 Florida’s recognition of Muslim Women’s Day makes Florida the first state in history to ever formally recognize and honor the contributions of American Muslims.